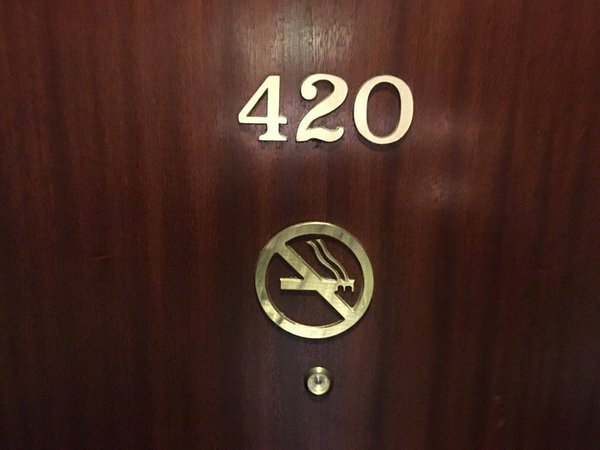 Why Do So Many Of The World’s Hotels No Longer Have A Room 420? For ages, it seems, hotels around the world have long gone without a room number 13, or even a 13th floor, because the superstition has always been that the number 13 is considered unlucky. 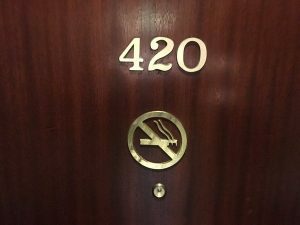 Recently, however, hotels have been so plagued with problems and destruction related to their rooms marked 420 that many have simply removed that room number from their establishments. Apparently, it has to do with the entrenched cannabis culture throughout the world. The number 420 has become associated with marijuana smoking related activities and the denizens of this community value anything that has the number 420 written on it. Many claim to know the origins of the number from the Grateful Dead making it up to it being a police code for pot smoking related crimes. In reality, though, it all began once upon a time in 1970’s era San Francisco. It seems that quite a few students at San Rafael High School back then just loved meeting up every afternoon at precisely 4:20 to spark up a joint or two or three. It was a secret knock, of sorts, that caught on like the proverbial wildfire. Now, every April 20, or 4/20 to you dudes and dudettes out there, has become an international celebration day of everything weed. For the hotels of the world, however, the marijuana culture has become a living nightmare. Tokers are forever smoking in their non-smoking facilities and are forever stealing the room signs. One hotel in Colorado has had the number 420 stolen off their door so many times that the owners just decided to stencil it in paint onto the door. 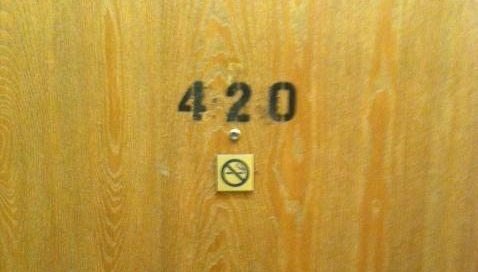 Some hotels have become creative with their signage and many just don’t have a room 420 listed or existing in their buildings at all. This, the hotels hope, will keep the marijuana culture away and will go a long way toward not having their establishments smell like a frat kegger on a Saturday night. 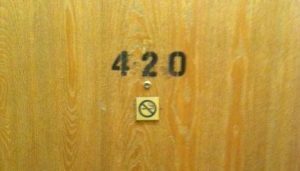 It seems that the 420 thieves are not just eyeing hotel room doors. Last year, in Colorado, where pot is actually legalized, the government had to keep replacing their 420 mile markers until they just put up mile markers that read: Mile 499.99. Oh, and here is one last one from Colorado: the government had to put up mile markers that read: 68.5 because people kept stealing the ones that read 69.